Swindon began as a small market town in Wiltshire and benefitted greatly from the Industrial Revolution, particularly with the rise in steam train travel. Hopefully you won’t need to let off any steam during your Swindon driving lessons, as all our driving instructors aim to make your driving lessons as enjoyable as possible! The car is definitely King in Swindon nowadays, with complex road junctions such as the infamous ‘magic roundabout’ replacing train tracks, but rest assured our fully qualified driving instructors are well experienced in teaching you all you need to know about dealing with complex junctions in preparation for your driving test. Ignition Driving School has a fully qualified female instructor in the Swindon area. My time with Ignition Driving School and Sandra Jones (my instructor) made learning to drive a great experience I will never forget. Sandra Jones made me feel at ease from the very start. Sandra's teaching techniques to assess my needs lesson by lesson was first class, with Sandra's humour, patience and professionalism made my lessons something to look forward to. If only everything in life was as pleasurable as learning to drive. Big thanks Sandra you star. I would recommend Ignition to anyone. I would like to thank Sandra for helping me to pass my test. I'm one of the typical blokes that leave everything until the last minute, and i had literally 1 week to pass, otherwise my theory ran out, then a year later my provisional would have ran out, so i didn't have any time left at all. Sandra fit her time around me as I'm also a single dad and found it hard to get a babysitter. With only a week left I took 7/8 sessions, but totalling 11 hours with Sandra and my previous experience was only 3 hours with a different instructor. Sandra picks up on the things you need to work on and drums it into your head which bits you need to improve and remember, because on the day nerves can sometimes get the better of you, but when u repeat the elements of driving you are struggling with, it gives you confidence to go out on the roads safely, and drive correctly, and prove to the examiner that you are a competent driver. 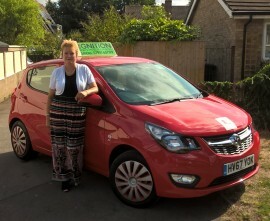 I would definitely recommend Sandra (Swindon) as anyone's instructor. I had a very good experience learning with Ignition Driving School. My instructor Sandra Jones was very friendly and helpful. I found it very good value for money and I definitely got what I paid for.